Anderson Silva is not only tired of Chael Sonnen running his mouth, he's getting sick and tired of being asked about Sonnen. In this interview, Anderson says that Chael needs to talk less and train more, and then scolds the reporter for asking too many questions about Chael. The reporter wisely clams up. Check it out. Rumors abound in the MMA world about the proposed Nick Diaz vs. Carlos Condit rematch. Will they or won't they? At first it was reported, and Dana White even twittered that a rematch was on. Now it appears that Nick Diaz has not agreed to the bout. Further speculation, and rumors, hints and innuendo, has it that Nick has tested positive for marijuana, something that will force a suspension on the 209/420 fighter. At this time, however, it's very unfair to Nick to make these allegations, and some websites seem to be reporting it as fact, but the truth of the matter is that no official word about his post fight drug test has come down from the NSAC yet. What does seem clear is that the rematch is in danger of not happening. And speaking of unfair, just having the rematch seems a bit unfair to Condit. He won a close but unanimous decision. Why make him do it again. What if Diaz wins the rematch by decision? Will they need to have a rubber match before a fight with GSP? Lots of drama and intrigue here. What will clear the air is the NSAC's report on post fight urinalysis results. As soon as I see that I will post it here. Until then, have fun speculating! After the jump, check out some fight pics from their first go round. GSP's boxing coach, legendary trainer Freddie Roach, is not impressed by Nick Diaz's boxing performance. In this video interview, Roach says that Nick has good hands, but his footwork doesn't cut it. He feels Nick comes in on a straight line and doesn't cut off the ring well. And this was before the Condit fight. 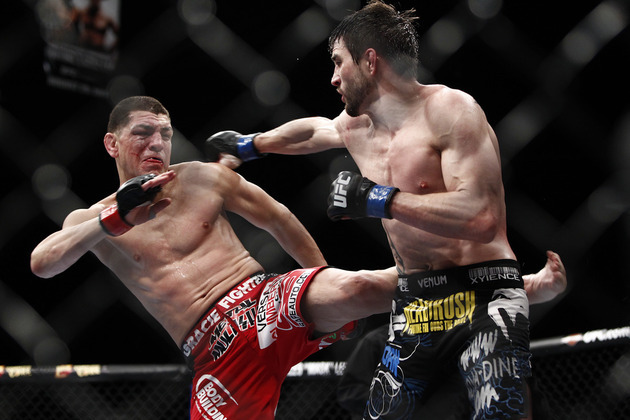 In the Condit fight, Nick did seem to chase Carlos by going straight at him, but the Octagon is not a boxing ring. It's huge and it has no corners in which to trap a fighter. Still, when Roach speaks it's wise to listen, and we'll have to see if Diaz can improve on his footwork in the just announced rematch against Condit. Here's the video interview with Freddie, who also talks about GSP's comeback after knee surgery. Deep in the jungles on Brazil, on the Xingu River in Upper Xingu, the indigenous people practice the art of huka huka. UFC MW champion Anderson Silva, made the trek to Upper Xingu recently to train with the natives to learn this art. Not that he really needs it, he's the most decorated UFC champion of all time, after all. 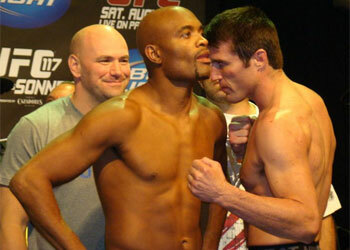 Still, it shows that Silva takes fighting very seriously and is always looking for an edge. Here are some pics of Silva training huka huka. These came from the website: http://revistatrip.uol.com.br. Amazing photos! "If you look back throughout history, there's only one show that I have ever said was a competitor to the UFC and it was Pride. Pride was the only show that I would ever put on the same level--and put on a pedestal--that was the same as the UFC." Nice of Dana to give Pride props, but it was a huge mistake for the UFC to shut down the Japanese organization. Pride filled 100000 seat arenas, and there is nothing like it right now. The day Pride died was a truly sad day for MMA fans in Japan and all over the world. 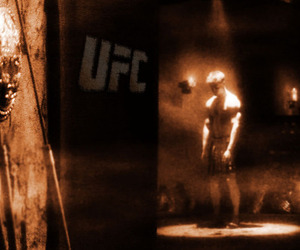 For some behind the scenes details of exactly how the UFC acquired Pride, check out my original short story: Business is War: The Inside Story of the UFC's Acquisition of Pride. Check out the Dana Telegraph interview after the jump. The UFC has done away with the Gladiator. The new intro takes highlight reel action and couples it with computer generated graphics. The result is visually appealing. It looks pretty cool. But they may have overdone, because the intro is better than many of the fights lately. And I'm not sure if people want to plunk down 60 bucks for this. Check it out, if you missed the UFC 143 broadcast. Click the pic to get to Bonenbreakerz Facebook page. Post who you think will win the Jones vs. Evans fight to enter. There are a lot of people disappointed with UFC 143, especially the main event, in which Carlos Condit used a counter-striking style to beat Nick Diaz. In the process, he pissed off lots of Diaz fans who feel that he just "ran away" from Nick and made it a boring fight. In this actual pic, a fan shows that he found the Koscheck vs. Pierce fight a snoozer. Literally. I'm assuming that this guy missed the UFC on Fox 2 show, because if UFC 143 bored him to sleep, UFC on Fox 2 would have put him into a coma. What do you think? Was UFC 143 a stud or a dud? I told you not to count Carlos Condit out last night, didn't I? 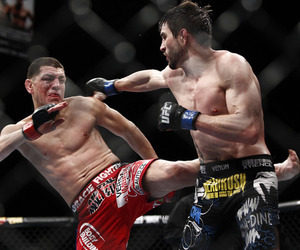 Condit won a unanimous decision victory against Nick Diaz at UFC 143, which prompted Diaz to announce his retirement in the ring immediately after the fight. Nick thought he'd done more than enough to win the fight, and felt that he was pushing the action, walking Condit down, and throwing the bigger shots. He said that Condit used "little baby" leg kicks, which is not enough to win. Condit did use his leg kicks very effectively, and he fought most of the fight backing up and countering. When Diaz would close the distance, Condit would move away. It was a very effective tactic against Diaz, and enough in all three judges eyes to win the fight. This morning, the MMA message boards are exploding with outrage that Condit "ran away" from Diaz all night, but in reality he fought a brilliant fight. Personally, I thought that Nick's pressure, and his takedown and back control of Condit in the fifth round won him the fight three rounds to two, but I can also see how the judges could give Condit the nod. Condit, who now holds the UFC interim welterweight title, will face Georges St. Pierre near the end of the year to unify the titles. GSP is on record saying that he wanted Diaz to win, and an GSP vs. Diaz tilt would be a much bigger seller than GSP vs. Condit. Still, Condit is deserving of his shot against GSP, and he deserves some praise for executing his gameplan perfectly last night. Instead, he's getting beat up on the boards by people calling him the new Kalib Starnes, who infamously ran from Nate Quarry in their fight. Some people wonder which brand of running shoes is going to sponsor Condit now. Yes, fans can be mean! As for Diaz, he announced his retirement immediately after the fight. It remains to be seen if that was just emotion talking or if he really will hang up the gloves. He came into the UFC looking to fight GSP for the title, but now he's at least a year away from that fight. So he might be serious about quitting the sport. In the co-main event, Roy Nelson once again showed his toughness by surviving three rounds with Fabricio Werdum. Werdum is known for his Brazilian jiu-jitsu skills, but he displayed some great muay Thai skills last night, busting up Big Country's face with wicked knees. Werdum is now in the hunt for a shot against Junior Dos Santos, the UFC HW champ.